Look around at your outside garden. Can it use more color? Would you like it if it had more variety? Would your garden be more attractive if there were flowers that have more fragrance? Check out these garden tips. You might also want to consider that orchids can easily provide these things and more to your garden. There are certain things you need to consider before adding orchids to the garden. 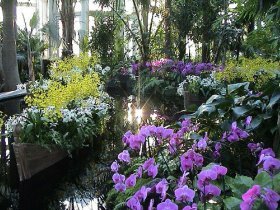 Most orchids in outdoor gardens do not need full sunlight. In fact, most do best in a bright area with indirect sunlight or sunlight through leaves of trees. Paphiopedilums prefer shaded areas. Cymbidiums like it less shade (but still some) and Epidendrums can get mostly full sun. Generally humidity is not a problem in oudside gardens except in the Southwest region of the US where it is dry. Most outside orchids need the temperature change between day and night to help induce the flower spikes for flowers. This is the same when they are in-doors. Most orchids can remain outside as long as the night temperatures are about 50 degree F. (10 C.). Cymbidiums however, can withstand temperatures to almost freezing. Outside garden orchids will like other orchids benefit from a regular fertilizer regime. The old adage for orchid fertilization is "fertilize weakly, weakly". This means to do it often and to use 1/2 or 1/4 strength of the label recommendations. Your orchids in the outside garden actually will be dependent on how much rainfall and sunlight and the ambient temperature. If there has been a good rainfall during the week the plants will not need to be watered but if it has been hot and dry there may be a need to water up to twice a week or even mist daily in the morning.